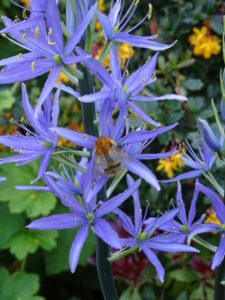 Camassia quamash or wild hyacinth will naturalise in grass and is happy in moist ground. 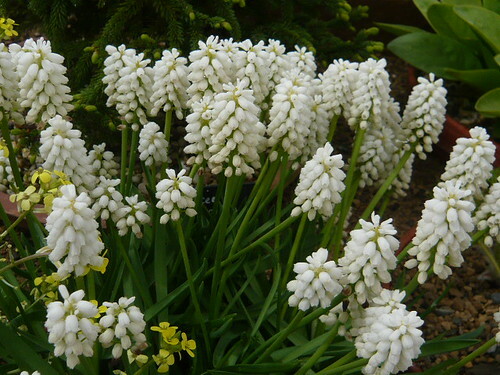 These bulbs have a reputation of being tough and hardy and thrive in less than perfect soils. Camassia leichtlinii is a spring flowering bulb with spires of creamy-white flowers although the more normal powder blue varieties are more often planted. 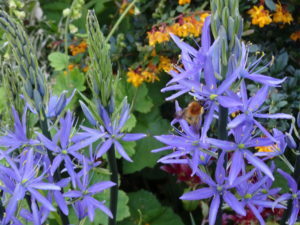 Camassia prefer to grow undisturbed and are not ideal for containers. Flowers open in spring and attract bees for their nectar. Death Camases are liliaceous, perennial herbs and are not edible. Naturalising means bulbs growing and seeding as they would in the wild; i.e. “in nature”. In some gardens this means growing bulbs in grass instead of borders. To naturalize bulbs they need to be planted where they can remain undisturbed without the need for the foliage to be prematurely removed. Leaves need to die back for about six weeks after the flowers have faded. Crocus will thrive for years if planted in grass with a dry or fast draining soil. 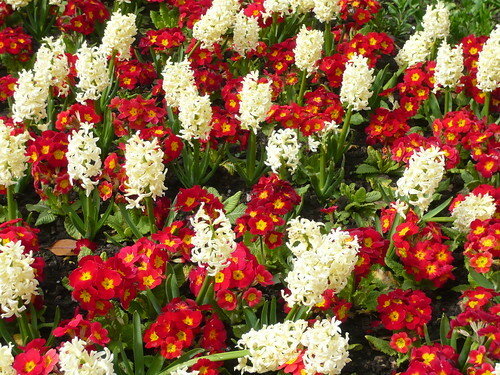 If the lawn is lush and gets lots of high nitrogen fertilizer it will stunt the flowering process of the bulbs. You’ll get lots of foliage but no flowers. Plant in groups or clusters so you can mow the other area. You need to be patient as a bulb seedling will take 5-7 years before it has built up reserves to flower. Above all do not deadhead the flowers so they can seed a couple of months after flowering. 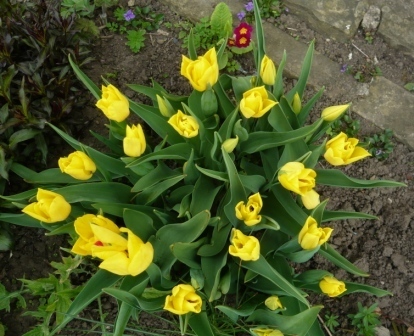 Plant species bulbs rather than showy doubles. It will soon be April and I need to check my over wintered tubers and buy some new varieties. The I can start my Dahlias in to growth. It is too cold to plant them out in the garden in April in the north so I start to get them going in pots in the greenhouse. Dahlias like plenty of space and their own area to grow so space them well. Dahlias need water and are hungry feeders so give them rotted compost in the hole before planting. 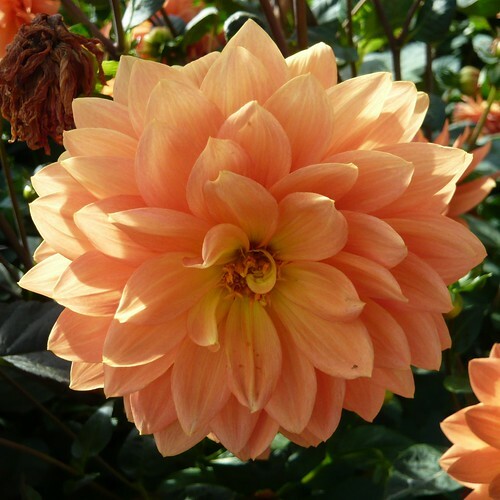 Dahlias can grow 3 – 4 foot tall and need some support. 3 or 4 canes or a proprietary wire support is appropriate. Dahlias are good for cutting but I find them short lived in the vase but that’s just me preferring flowers in the garden. Dahlias can be left in the ground over winter and subject to a very late frost will survive -give them a deep winter mulch when you cut them back after the leaves have been blackened by the first frost. 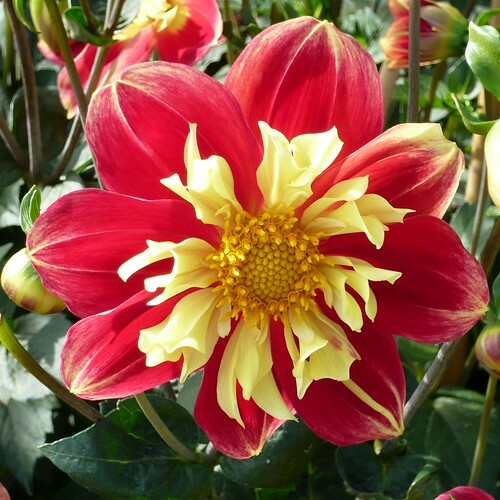 Digging up dahlias and keeping the tubers gives you chance to dived the plants or take cuttings from stock started into growth early in the year. If you want to bulk up stock of one plant start them into growth in wet compost in the warmth in February – when shoots are 2″ or more take them as cuttings and give them warmth at the roots. The season was wet and the dahlias enjoyed rapid leaf growth. Slugs ate the white varieties but left other leaf alone – strange! I did not deadhead enough and lost some of the flower power. Now the first frost has sent the leaves into soggy decline I will dig up the tubers, allow them to dry and store them for next year. The North of England is too cold and damp for the tubers to survive in the ground through winter. I have just bought and planted some Autumn ‘Crocus Speciosus’ AGM that were part of a birthday present. I could have waited until summer to plant the bulbs. Flowering bright blue are about 4 inches tall. I hope to see the blue veined flowers with deep yellow stamen by October followed by leaves in spring. The thin flowering stems find it difficult to withstand wet and windy weather and are inclined to flop but I have given them some shelter in the rockery. Autumn crocus are not cheap but they can last for years given favorable conditions. 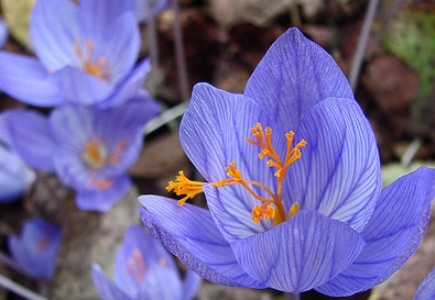 Autumn crocus or meadow saffron is a poisonous member of the lily family. Plant about 4 inches deep and be prepared for them to flower a bit later the first year. Excellent for naturalising in wild gardens, rockeries and between shrubs according to my packet instructions (but they are unlikely to say good chance of failure). Many colchiums and autumn crocus they can flower without soil indoors prior to planting out. Increase your stock via freshly ripe seed or dig up the corms when the leaves fade in spring pulling them apart and replant the cormletts. Mice can be troublesome because they eat the Crocus corms so protect them if you are troubled. 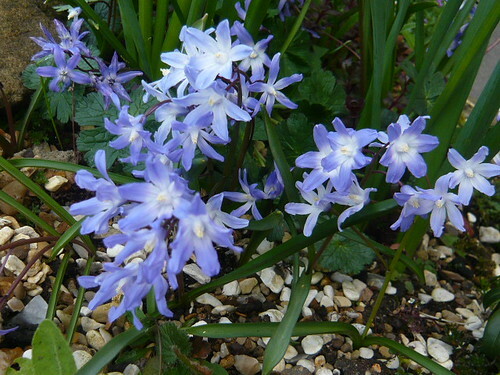 Chionodoxa are beautiful, hardy spring flowering bulbs that are easy to grow. They grow 6inches tall from small bulbs and have pretty star-shaped flowers with long narrow leaves. (Also spelled Chinodoxa and common name Glory of the Snow). The blossom has a central line on each of 6 petals. They do well in most garden soil. Plant 2-3″ deep. Chinodoxa are most effective when planted in clumps and allowed to naturalise. Suitable for rockeries and growing in pots. Flowers lasts for 3-4 weeks, after which both the flowers and the foliage die back. 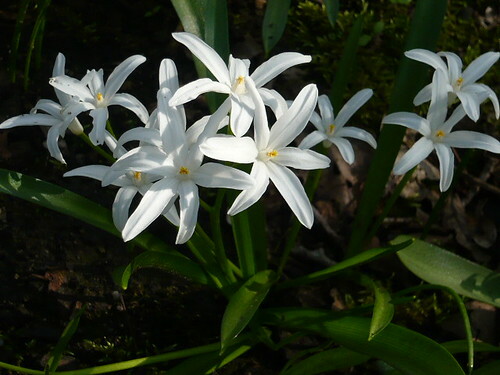 Chinodoxa Luciliae Alba is a clear white with star shaped flowers in March. Chinodoxa Forbesii Pink Giant produces a wealth of pink flowers. Chinodoxa Forbesii is bright blue with a white centre. Tale Valley nursery hold a national collection of these floriferous plants. 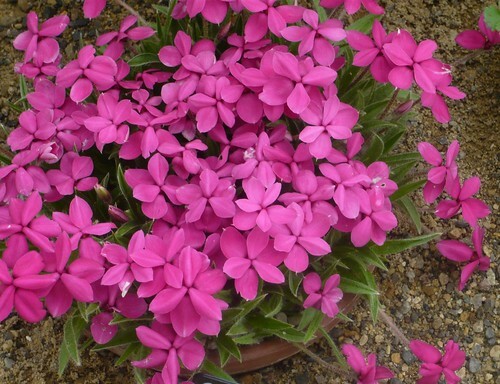 For a short intensely coloured alpine or pot raised plant there is little to touch Rhodohypoxis. The flowers are thick and wax-like white or shades of pink to purple. Interesting doubles are now being bred such as ‘Lilly Jean’, ‘Hope’ or ‘Kiwi Joy’. Rhodohypoxis grows to 2″ in height although Rhodohypoxis deflexa only reaches 1″ or less depending on position in your garden and Rhodohypoxis ‘Tetra White’ can be 4″ tall. Regular dead-heading of the spent flowers helps to improve flowering performance. Grown in plastic or terracotta pots, they are best re-potted every year. Add a high potash slow release fertilizer into the compost at potting time. Around May the first lance-shaped leaf growth appears. They are quite short and form a spikey matting until covered in flowers for the rest of summer. 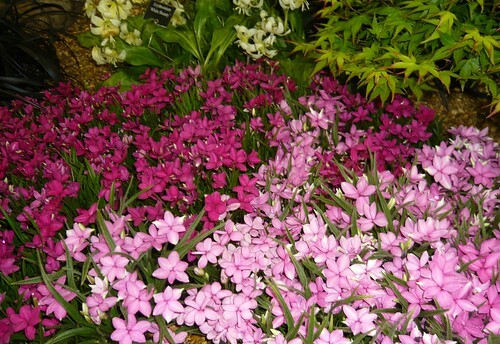 Rhodohypoxis will happily withstand freezing cold provided the plants are kept almost dry through winter. Their chances of survival outdoors can be enhanced by placing a pane of glass over the top of them during their dormant period. Provide a liquid feed to build up the, small corm like, root stock during the growing period. Trim off dead foliage and store corms through winter in a cool environment. Propagate by division when dormant. White flowers with shorter but wider leaves. Look out in other gardens for great bulbs to grow for next spring. 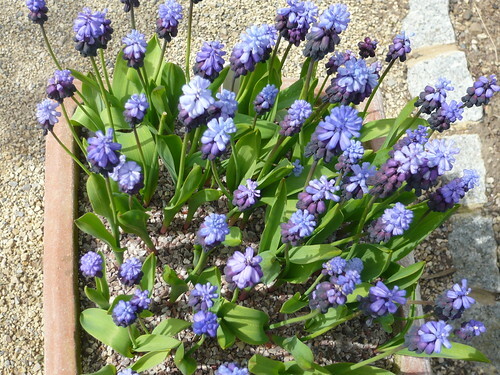 This Grape Hyacinth called Muscari Azureum is a clear soft blue that is recommended for naturalising. 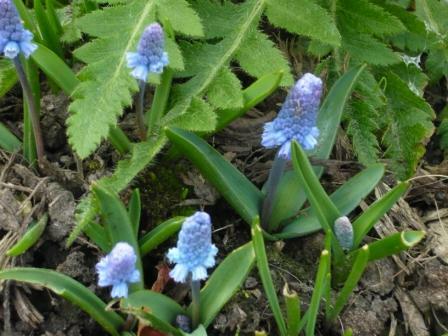 Muscari Valerie Finnis is also blue whilst most of the other species and varieties flower in shades of purple. Muscari grow well in pots where the foliage can look interesting. I have not tried Album or Botryoides Album both white Grape or Feather Hyacinths, nor the new scented yellow Golden Fragrance. Feed with a potash fertilizer in early spring to help roots and bulbs. Plant between September and December. Christmas indoor bulbs need to be ‘prepared’ and planted as soon as available. Put an inch of grit in the bottom of a pot to help drainage and cover the top of the bulb with 3″ of soil. Deadhead and allow leaves to die down naturally. Propagate by dividing clumps in early autumn. 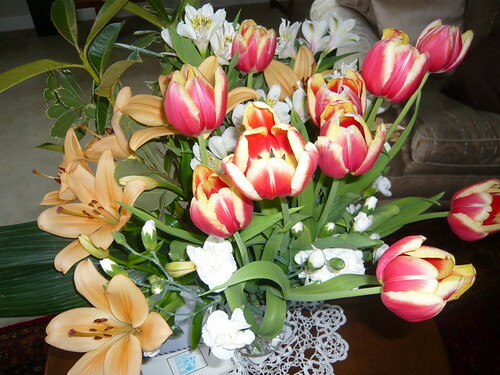 Certain Tulips last longer in a vase than others. Viridiflora, Fringed and Parrot tulips are especially long lasting often exceeding 10 days. Pick Tulips that are just turning from green for longest life. Groenland a green stripped viridiflora with pink petals. Union Jack with a large white cup touched with red. Shirley appears cream but turns to white and matures with a hint of purple. Queen of the Night is a late flowering dark flower almost like the infamous black tulip.